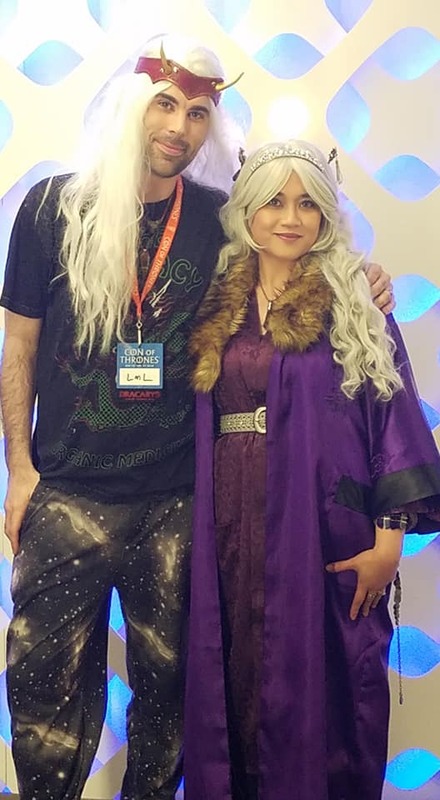 My best recounting of the weekend is the Con of Thrones Photojournal livestream I did, where I was joined by several guests to review photos from the Con, including side-of-stage shots of the entire cosplay parade captured by the one and only Amethyst Koala. Special thanks to StoneDancer (@Implode_Optical) for allowing me to show some of his fine photos! You can also find more panel footage over at Azor Ahype’s YouTube channel, including their Ragnarok in ASOIAF panel that I made a guest appearance on, as well as Joe Magician’s YouTube channel, who took part in some great panels including my own “What Makes G.R.R.M. Great” panel, which you can find below. Thanks everyone, and enjoy the panels! My solo panel laying out the basics of the moon meteor theory, Dany acting out the Qarthine myth and the Azor Ahai reborn prophecy by waking the dragons, and why Venus is the Morningstar. This video now serves as the best overall introduction to mythical astronomy, so please share this one anytime you’re telling a friend about what we do here. We made some new myth heads here, and I had a ton of fun shining a flashlight on Martin’s world oh mythical symbolism. Featuring Crowfood’s Daughter of the Disputed Lands YouTube channel and Quinn from the Ideas of Ice and Fire YouTube channel! We had a great discussion of the cycles of the seasons, horned nature gods, those who defy the grave like the Undying and the Others, and more. As you can see, I did this one as the King of Winter. I brought on two of the smartest people I know, Gemma of the Secrets of the Citadel YouTube channel and Joe Magician from the Joe Magician YouTube channel, to dissect some of the writing techniques that George uses to make ASOIAF heads and tales above the rest! We three plan to revisit this topic on a future livestream, there’s just so much to discuss here. The unreliable narrator, George’s tapestry of influences from literature, legend, and history, the “in-late, out-early” technique, and more. Having no idea what to expect for this panel, I went ahead and launched into my green zombie Jon theory, only to realize half the crowd were show watchers and didn’t know what I was talking about (Jon isn’t even a warg in the show, for example). Gradually, and with the help of other panelists like Jameka Knot, Steve Love, Ser Hunts, and Michelle McKelley, we filled everyone in and ended up having a great discussion comparing TV and book Jon, and about the darker possibilities for the book version. Having already developed good chemistry with my panelists, the Don Tony Teflon from Teflon TV and Quinn from Ideas of Ice and Fire, on our appearances together on Gray Area’s YouTube channel, I knew this was going to be a good panel… and it turned out even better. Tony was a riot with his children of the forest-phobia, Quinn talked about creepy things in a deep voice, the audience asked some good questions, and I mostly resisted talking about the Old Ones. Audio only, but well worth listening to. This went deep, and it got hot too! We went head-on into the land of gender roles and societal expectations, what constitutes a “god” in ASOIAF, what an archetype even is, and a few other equally fascinating topics. Crowfood’s Daughter of the Disputed Lands really shone on this one, and chipping in and rounding out were myself, A.Ron Hubbard from the Bald Move, and my good friend Quinn from Ideas of Ice and Fire.